Acca Kappa Soothing & Invigorating Shampoo & Shower Gel 200ml. This is a shampoo and shower gel with Ginseng and Black Tea extracts. 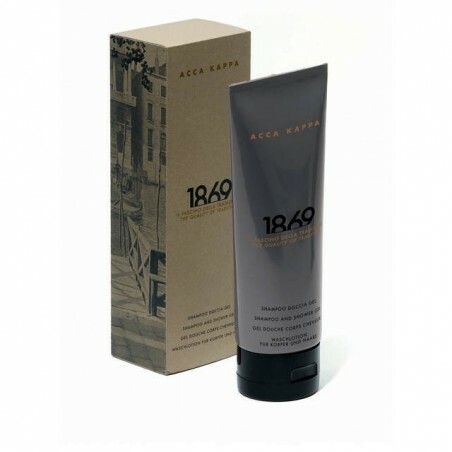 It has antioxidant and anti-ageing functions, suitable to meet the needs of men's skin. It is a shower gel particularly gentle for the cleansing of the hair and body. The product is enriched with natural extracts softening your skin. It exerts a soothing, toning and moisturising action. How to use it: Apply a small amount of the product along the full length of your hair and on the wet skin of your face and body. Massage gently and rinse thoroughly with warm water. Repeat the application on your hair and leave in for a few minutes. INGREDIENTS: Aqua (Water), Cocamidopropyl Betaine, Peg-7 Glyceryl Cocoate, Peg-200 Hydrogenated Glyceryl Palmate, Glycerin, Sodium Laureth-11 Carboxylate, Laureth-10, Panthenol, Polyquaternium-7, Panax Ginseng Root Extract, Camelia Sinensis Extract, Chondrus Crispus Extract [Chondrus Crispus (Carrageenan) Extract], Dextrin, Lonicera Japonica Flower/Leaf Extract [Lonicera Japonica (Honeysuckle) Flower Extract], Benzyl Alchol, Potassium Sorbate, Tetrasodium Glutamate Diacetate, Lonicera Caprifolium Extract [Lonicera Caprifolium (Honeysuckle) Flower Extract], Dehydroacetic Acid, Citric Acid, Parfum (Fragrance), Limonene, Linalool, Hydroxyisohexyl 3-Cyclohexene Carboxaldehyde, Butylphenyl Methylpropional.